Website owners want their sites to run as fast as possible – and the well-known W3 Total Cache plugin (W3TC) is a popular option to optimize your WordPress installations. When W3TC is properly configured, it will help your server handle greater traffic loads without jeopardizing the response time of your website. W3TC offers lots of functionality for free, while some premium features are unlocked when the user upgrades to their Pro plan. However, the plugin lacks some documentation and it’s not always easy to understand which features must be enabled and set up. 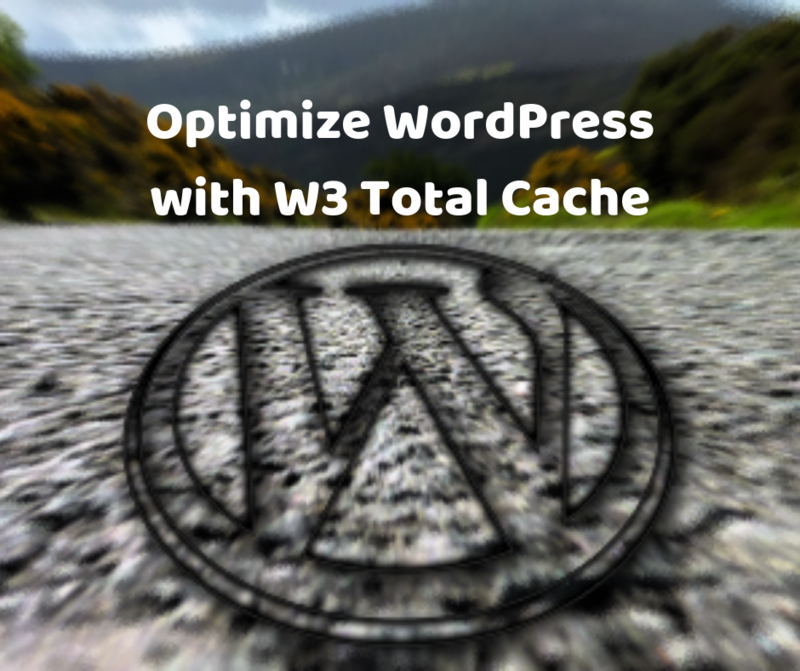 In the remainder of this article I’ll review the main caches you can set up with W3TC in order to optimize WordPress. You’ll see how they work and the main settings you can fine-tune. I’ll also point out at some alternative solutions you might explore in some – more advanced – use cases. Let’s start! In order to achieve this, web servers send some headers back in HTTP responses to tell receivers (browsers, proxies, etc) if/how/for how long they can cache the content. HTTP 1.1 introduced the Cache-Control: header to handle this. Let’s see some common use cases. E.g. some websites have versioned assets whose names always change as their content changes (e.g. scripts-7457f3.js, where “7457f3” is a checksum of the content). Alternatively, developers may add a query string to distinguish among versions (e.g. ?ver=1.2). The latter approach is widespread among plugins and themes WordPress developers. In these cases, the server can instruct the client to cache an asset for a long time – e.g. one year – by sending back the header Cache-Control: max-age=31536000. The value in max-age specifies the number of seconds the content can be cached before being considered stale. Before HTTP 1.1, the expiration date had to be given as an absolute timestamp in the Expires: header, e.g. Expires: Wed, 22 Jan 2020 14:18:26 GMT. While you can stick with just Cache-Control:, you can safely include Expires: too since the former will take precedence at the client. Server returns Last-Modified: header with a timestamp, so the client may include If-Modified-Since: header in future requests. In case the file hasn’t changed since the given date, the server replies with an HTTP 304 Not Modified response. Server returns ETag: header with a checksum of the resource’s content, so the client may include If-None-Match: header in future requests. In case the file’s checksum is the same as the one given, the server replies with an HTTP 304 Not Modified response. Finally, if you want intermediate proxies (say your CDN) to cache your files, you should also add the public attribute to Cache-Control: headers. Your CDN places your content closer to your visitors, hence reducing network latency and overall page load. We recommend Cloudflare, but any other CDN can do a great job. Cloudflare is a so-called pull CDN – i.e. you don’t have to upload your assets to their servers. Cloudflare caches your website’s resources as your visitors ask for them. Hence, you don’t really need to set up anything in W3TC – you can leave the default config as-is. That said, you might want to enable the Cloudflare extension in W3TC. You can provide your Cloudflare credentials and such extension will let you customize some CDN settings. The good thing about the extension is that W3TC can purge your CDN when you update your content. While this is fairly convenient, we don’t personally do that because we don’t cache HTML at Cloudflare and we rarely update our static assets. When we do, we just log into our Cloudflare’s account and purge the caches right there. In this way, we don’t have to provide our WordPress installation with our Cloudflare credentials. 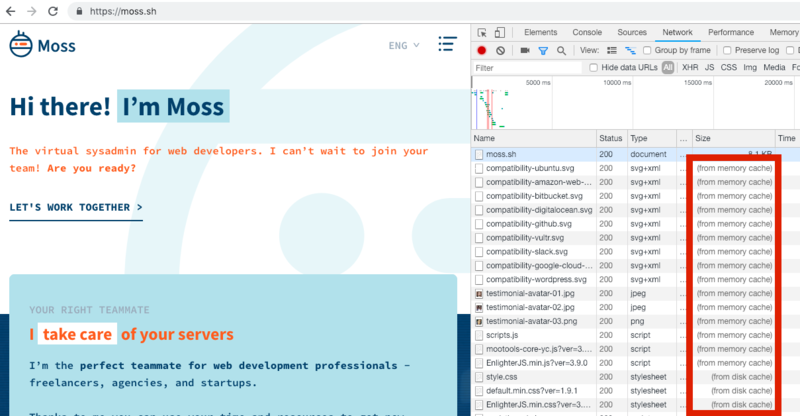 However, if you cache HTML at Cloudflare, you update your content on a regular basis, and your website is well-protected, you should consider enabling this extension. By default Cloudflare overwrites the expiration date your origin server sets in Cache-Control: and Expires: headers. In order to have a single source of truth, head to “Caching -> Browser Cache Expiration” in Cloudflare and set the value “Respect Existing Headers”. By default Cloudflare doesn’t cache HTML files. Some people draw wrong conclusions about the performance of their sites behind Cloudflare because they’re not aware of this. If you’re sure you want Cloudflare to cache your HTML, then follow the steps in this article. 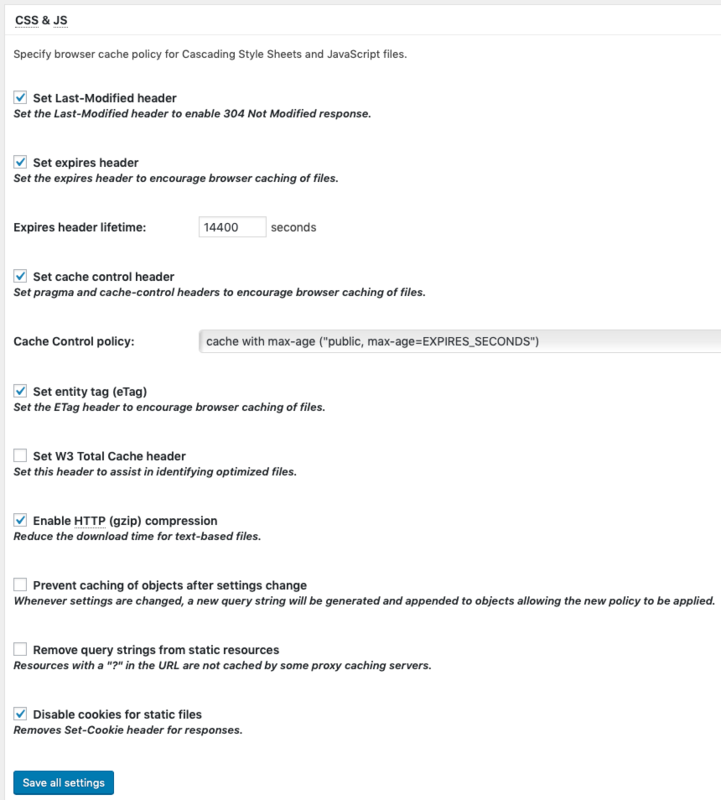 By default Cloudflare doesn’t cache responses with a cookie or if the Cache-Control: header is set to private, no-store, no-cache, or max-age=0. And this is great, since it gives us ways to make sure that non-cacheable content will be ignored by our CDN. On the other hand, if you use a push CDN – i.e. you upload your assets to their servers – you can explore the different settings that W3TC offers to set it up. A detailed review of these ones is out of the scope of this post, but you may refer to W3TC’s CDN wiki. The Page Cache is likely the feature that will have the greatest savings on your server’s resources. Head to W3TC’s “General Settings” and choose the “Disk: Enhanced” method. This method works as follows. Whenever WordPress returns an HTML page upon a request, W3TC saves the response in a file and adds a redirection rule in the web server. Such redirection makes the web server return the content of the cached file the next time the the same page is requested. Please read again the former paragraph, since there are some misunderstandings out there on this regard. Some people think that they must use other (more complex) caching technologies because WordPress cache plugins perform poorly. They say so because they (incorrectly) think that every request involves spawning a PHP process and running plugin code that returns the cached document. As we’ve just seen, this is just not true – the web server itself returns the cached document if you’re using the “Disk: Enhanced” Page Cache of W3TC. And, in most cases, this is really fast. The default web server stack for WordPress in Moss is Nginx as a reverse proxy in front of Apache. This means that W3TC adds their redirection rules within the root .htaccess file of your site, so that Apache returns the cached file as soon as it’s requested. Usually, you want to cache your front page since it’s the most visited one in most cases. You usually want to cache HTTPS requests too. In fact, you should always serve your website via HTTPS [Moss automatically redirects HTTP to HTTPS, by the way]. If you’re running a company blog like we do, you won’t want to cache pages for logged-in users. However, there are use cases in which this is important to improve the user experience in your website. See how to cache content for logged-in users in the section below. Purge Policy. Indicate the pages and feeds to purge when posts are created, edited, or comments posted. This is very dependent on the nature of your website, but also easy to determine by yourself (e.g. we don’t purge the front page because it doesn’t show any blog post, but we do purge the posts page and blog feed). Non-cacheable content. If you have content that must not be cached, you have to tell W3TC about it – you can exclude them by file name, category, tag, author, and custom field. Otherwise, don’t worry about this. In some advanced use cases, you might consider to preload the cache proactively. Most likely not required, but it could help in your case. If you don’t really know what these settings actually mean, you can better leave their default values. WordPress provides an Object Cache API to let developers store the results of complex (i.e. time consuming) operations – usually database queries. By enabling the Object Cache in W3TC, you ensure that such results will be persisted to be reused across requests. Whether you can benefit or not from this kind of cache is really dependent on the nature of your website and the software (plugins and themes) it runs. In general, very dynamic sites like online communities can get higher savings when enabling this cache. Mostly static sites like company pages or personal blogs won’t experience a significant speedup with the Object Cache. However, your mileage may vary – you can experiment with your site to check whether this cache is worthwhile in your case. To enable the Object Cache, head to the “General Settings” of W3TC. You must choose a storage backend for the cache. Whenever possible, choose Memcached or Redis as the Object Cache Method, since they’ll store the objects in memory – faster access than the Disk backend [you can install either Memcached or Redis with Moss in one click]. Now head to the “Object Cache” section to fine-tune your setup. 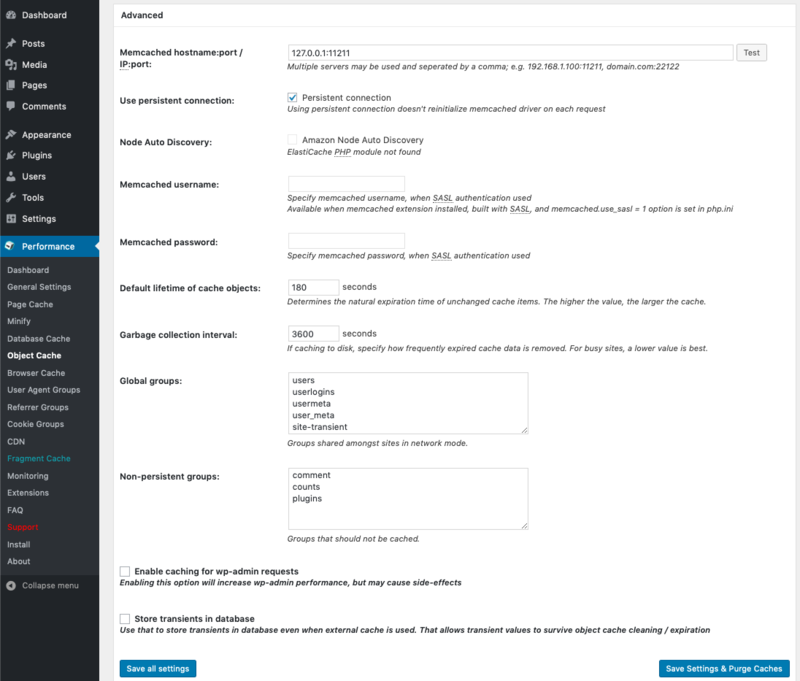 If your backend is Memcached or Redis, you must provide the hostname:port WordPress will use to connect to the service. 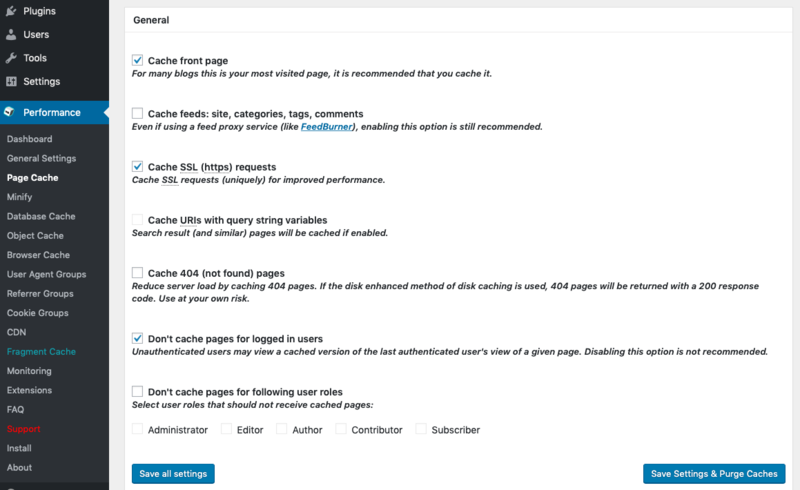 I’ve never had to enable caching for wp-admin requests, but your use case might differ. I don’t usually store transients in the database, since purging them from the cache has never caused a performance issue in the websites I’ve seen. The default values of the remaining settings are likely ok for your website, but review them first. You’ll see there’s also a Database Cache in W3TC. Leave it disabled: If any, use the Object Cache instead. In addition to caching, W3TC provides features like minification – i.e. it can reduce the size of your assets to minimize their download time. We encourage you to minify your resources, and W3TC is one of the means you can employ to achieve it. But if you’re using Cloudflare, don’t minify in both Cloudflare and W3TC – choose just one of them and disable minification at the other. In some websites, e.g. membership sites, most users log into your website and see their specific content. In many cases, the Browser Cache and the Object Cache are enough. But if you really need to cache per-user pages, then you might consider other plugins like WP Rocket. If you need to get the most out of your e-commerce website, you should consider more advanced setups. In an e-commerce you usually have both cacheable (e.g. product descriptions) and non-cacheable (e.g. the shopping cart) content in the same page. You can edit your template to add marks that tell W3TC not to cache a given section of the page. Then enable W3TC’s Fragment Cache and set it up – note that this isn’t included in the free version of W3TC, you need to upgrade. Alternatively, if you have an e-commerce site with serious revenue, you might also consider Varnish as your default caching solution. It supports Edge Side Includes (ESI) that provide the functionality we’ve just described. Caching is a must but not the only way to improve the performance of your WordPress site. If you have fewer and higher-quality plugins, they could make a difference in the response time. You can also enhance the underlying infrastructure of your website (vertical scaling, i.e. better servers, disks, and networks) or spread the load among multiple servers (horizontal scaling, the setup is way more complex in this case) to achieve higher levels of performance and scalability. Providing your users with the best possible experience should be your #1 concern. But it’s hard to achieve that if your website takes ages to load. In order to prevent that, a good caching policy is one of the first things you must consider to improve the response time of your website. In addition, serving cached resources is “cheaper” in terms of server resources, so you can support more users/visitors with the same hardware. There are lots of caching alternatives, but if you’re running WordPress sites, a good cache plugin is the best way to proceed in many cases. If you choose to use W3 Total Cache – a very popular free option – don’t forget to enable and properly set up the Browser Cache and the Page Cache in “Disk: Enhanced” mode. Also use a CDN whenever possible, since it’ll further minimize the load on your servers. In case you use Cloudflare, take a look to the various remarks I’ve reviewed in this article. Finally, remember that no size fits all: Depending on your site’s requirements, you might need a different plugin or a completely alternative caching solution. If you enjoyed reading this, please share it and subscribe to our blog so that we send you an email as we post new content. And in case you haven’t tried Moss yet, sign up now and check how it can help you manage your servers and websites!